Great to see you flirting with London restaurants again Mr. N - top notch noodle article! The toppings for both look frankly pathetic. Stingy and miserly bits of meat, and in cocoros case overcooked egg. In fact the portions for both (as for Nagomi as well) look decidedly small. Can you at least order extra noodles, decide the firmness of the noodle and the richness of the broth? What we need is a good chain, like Ippudo (branches in NYC, HK, S'pore) to come to London and show these folks how it's done. Until then I'll stick to the siu kow noodles in Chinatown. Agree with Justin, we really do need a good, reliable chain that serve authentic proper 'DIRTY' Tonkotsu that doesn't break the bank. 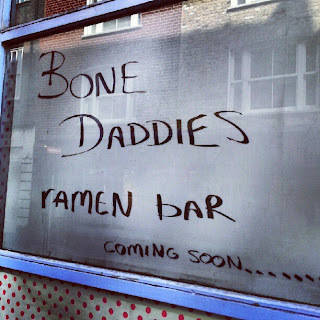 I am looking forward to the opening of bone daddies, but I do hope it's not another overhyped, over priced and meagre attempt of Tonkotsu though. We have enough of those, I just want all the right element to make a perfect bowl of Tonkotsu in one bowl..is that too much to ask? Hell, I'm willing to overlook the overpriced bit if this is achieved. Fingers crossed! Toku is indeed deeply mediocre and I did blog about it. Ittenbari and Taro are similarly meh, while I greatly enjoyed Tonkotsu. 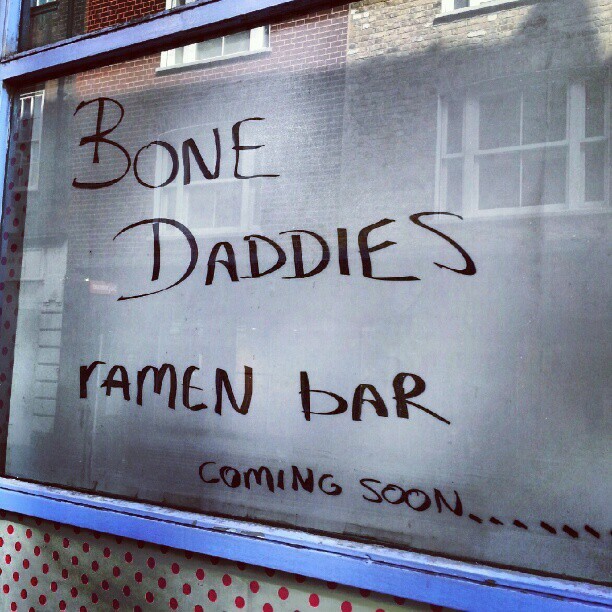 Might have to try Cocoro and definitely looking forward to Bone Daddy's. HF - we definitely need more Champions League, less Europa League category noodles. Frank - and therein lies the problem. I'm not saying it's wrong to like a lighter broth (the full-on tonkotsu is not everyone's bowl of noodles) but there is a danger that the broth can tend to be a bit lightweight in an attempt to be all things to all people. Justin - you can order extra noodles at Cocoro and Tonkotsu, but I find that's another piss-take as the cost up rachets up some more for not a lot of extra noodles. Otherwise, I'm not sure about other specifications. Perssonally I like to see what the 'default settings' are at ramen joints. Ippudo would be good, but I'm surprised no one has got it right just yet. J - agreed. If either of the bowls I tested was the full package, I could overlook the price tag. But they're not. PickyGlutton - thanks for your thoughts. I wouldn't even bother comparing ramen bars.. I would just love them all :) You got me droooling! I thought Tonkotsu had the slight edge on Cocoro, in terms of broth, noodles, toppings and value. The football analogy is right, I just thought it was a case of Spurs (tonkotsu) vs Newcastle (cocoro). Why is it that London can't do great Japanese food (with one or two notable exceptions, mostly around sushi)? Particularly the the lower-end less fine-dining down-and-dirty-but-still-delicious stuff. Maybe it's just a lot harder than it looks. Still, average ramen is better than no ramen. Isn't it? Anon - really? To be honest, in common with games involving the likes of Spurs, Everton and Newcastle, there's not much in it and the result can vary! Winnie - I love ramen, but you're right about finding a decent place to eat it. The cost and relative quality make it a poor noodle option when compared to Chinese and Vietnamese alternatives. Gworm - ramen (and 'budget' Japanese grub) isn't easy to master. That said, there are many cities around the world (outside Japan) that have proper ramen. Which begs the question why not London? Mind you, am I being ultra-critical? The likes of Tonkotsu and Cocoro are a step-up from the dreaded Wagamama. The last time I was in Tonkotsu the broth was actually tasted of chicken stock, maybe they ran out and thought noone would notice. Prob they were tight. But as Ramen bars go, Tonkotsu is prob the best around, but somehow i prefer Ittenbari but mainly for the ambience, but Koya has my vote on general noodle bars, i wish they would open a ramen shop then the bar would be put higher for everyone else to follow. Mzungu - tonkotsu is meant to be a blend of pork and chicken stock, but obviously the latter is not meant to predominate. A shame. I've yet to try Ittenbari, as I prefer tonkotsu to shio/shoyu/generic ramen. hee da bao tonkotsu's toppings to bring to cocoro.